Each of us is endowed with a fascinating perceptual system (explained by Perceptual Control Theory (PCT), created by William Powers, (author of Behavior: The Control of Perception and Making Sense of Behavior) that is designed to make sense of our environment so we can build a satisfying life. That perceptual system enables us to give individual meaning to the world we live in. We fashion this meaning through various systemic levels. Ultimately, there is a highest level where each of us stands as our own person-where “I am the captain of my own ship.” Below are brief descriptions of the three highest levels of the perceptual system, which guide who we are and everything we do. It is at the Program Level where students are helped to resolve their problems by making plans to accomplish their goals without violating the rights of others. Using the PCT chart as a guide, here is a scenario to help explain the various aspects of the PCT model. 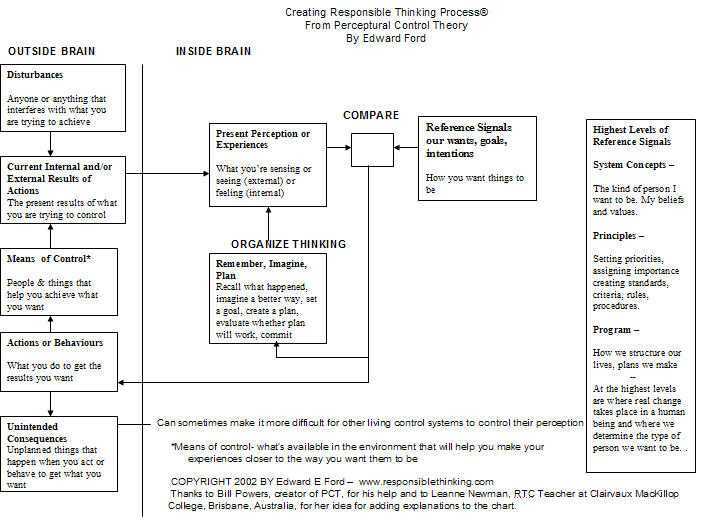 Further explanations of PCT can be found in Powers’ books mentioned above, in various chapters in Discipline For Home And School, Books One and Two, in Freedom From Stress (Ford) and in various sections found on www.responsiblethinking.com. Mrs. Kuhn saw Mathew violating a school safety rule, “no running in the halls.” Mathew, on the other hand, wanted to be on time to his class. Herein lies the first step to an understanding of PCT. As you can see in Figure 8.1, Mathew’s Reference Signals or Goals were two: he wanted a few precious moments with Emily, the current love of his life, and he also wanted to be on time to class. Those were the two things he wanted. Mrs. Kuhn on the other hand was charged with monitoring the hall in her classroom area, and saw Mathew running, his Actions or Behaviors, which is what she saw Mathew doing. As a Living Control System, in this case as human beings, we none of us are aware of what goes on Inside the Brain of another human being. In all the school discipline programs of which I’m aware, it is the Actions of others that educators attempt to change. And how do we try to change them, by acting as a Disturbance. We try to do something to them, in the way of punishment, or threats, or criticism, or whatever, to get them to change their Actions or Behaviors. In Mathew’s case, Mrs. Kuhn could have stopped him, lectured him or have written him up or, as someone whom she may have caught running on numerous occasions, she could have sent him to the office. Mrs. Kuhn was dealing with what she “saw” Mathew doing, his Actions. Mathew, on the other hand, was trying to arrange a way of satisfying two apparently incompatible Goals, time with Emily and getting to class on time. At the moment Emily left him to go into her class, he Perceived himself at great distance from where he needed to be at the time, and he Behaved to correct that situation. The current results of behavior are what he is actually accomplishing: staying with his girlfriend, and making it hard to get to class on time. That’s what his actions are accomplishing. One of the results is close to the result he wants: he wants to stay with his girl, and is doing so. The other result is far from what he wants to accomplish: he wants to get to class on time but has stayed too long and is too far from the class to do it. Thus, he creates a problem with Mrs. Kuhn by breaking a rule and getting her unwelcome attention. Supposing Mrs. Kuhn, using the RTP® questioning process, had called to Mathew, “Mathew, what are you doing?” He may have looked at her, stopped running, and said: “I’m trying to get to class.” (Notice he stated what “he wanted to accomplish – his goal” and not what Mrs. Kuhn “saw him do – his actions.”) And he then might have continued, walking at a fast clip. Later, she might have mentioned to him that she often saw him running in the hall, and asked if running in the corridor was against the rule. If he acknowledged such, she might have asked him if that was going to get him into more trouble and if so, would he like to work on solving this problem. She was obviously willing to teach him how to organize his thinking. If he saw her as sincere and willing to help him solve his dilemma, or, to put it in PCT terms, as a Means of Control, Mrs. Kuhn would be helping Mathew by using the techniques of RTP. She would have been asking him to look within himself (at the higher levels described above), decide how he wants to be (in this case, live within the rules or continue violating the rules), and then learn how to structure his life such that he can accomplish his Goals without violating the rights of others. His plan might include a better time to leave his girlfriend so he can be on time to class without breaking school rules and arrange for other times to visit with her.